Mont Mallet West couloir is tucked away on the north side of the Dent du Geant, along the ridge of the Periades. Normally you ski this line by climbing up the Breche Puiseux and climbing some mixed group to reach the shoulder of the Mallet. We decided to climb the line. This is not normally done because of the time spent exposed beneath the Noir seracs. We moved fast to minimise this exposure. First bin on weekend is now 7:30 and after Mikko exchanged multiple lift numbers we managed to get on the second bin and had our skins on by 8:30. I had skin malfunction within the hour and resorted to climbing with crampons. The snow was very firm on the glacier and this did not slow us down. Upon arriving at the base of the couloir we started to get deeper with each step and soon we were wading up the couloir in nice powder snow. Ditching all our unnecessary gear at the bottom we made reasonable progress up the line sharing the trail breaking whenever I could. The sun had softened the harder sections of snow by the time we started skiing and it was good powder all the way down. Somehow we made it to the train for 3:30 and I rushed to work at 4:40, ten minutes late. Very tired, and surprised to find good snow so long after the last snowfall. A good couple of days spent in the mountains. Meeting Mikko at the lift for first bin we were already a couple of people short of our original 4 team so it meant more boot packing for the both of us. Heading over a very ominous looking bergschrund we started the boot pack up the NE Spur. Soon we were joined by Jose who came along with us and shared the effort. After being plastered by howling spindrift and heavy sluff for the most of the climb we came to the diagonal ramp about 2/3rds of the way up. Here the couloir narrows and the only way up was to climb through the heavy spindrift/ sluff that was puling down the face. We called it a day here. Strapped on our skis and enjoyed a great ski back down. At the bottom we crossed the bergschrund on a bridge that was not there 2 hours earlier when we started. Lots of moving snow! The day after I was heading through the tunnel with Sleigh to search for some spring corn. I have admired the south face of the Dent du Geant for a couple of years now. Its a great looking hanging face that requires you to traverse to avoid the cliffs below. After a 2 hour mixed climb in the baking hot sun we reached the top of the line by 11:30. 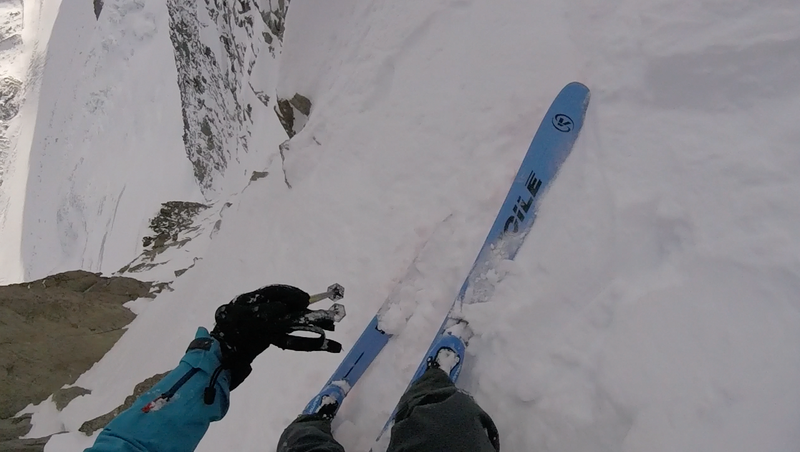 Starting off down the steepish couloir we found great spring powder that then turned into corn. Enjoying the descent we soon realised that we would have to start making the traverse to skiers right. Just as we started the traverse the thick cloud came in and we were in a white out. Moving from ridge to ridge in the dense cloud was unnerving but we eventually found the exit ramp down to the Marbrees. Lots more spring skiing came after until we arrived back at the car. Great morning out. With what seems like weeks of high pressure settling in here in Chamonix there has been a lot of great stuff being skied. With the first few days spent finding great powder off the lifts we have started to go further afield in the search of powder. 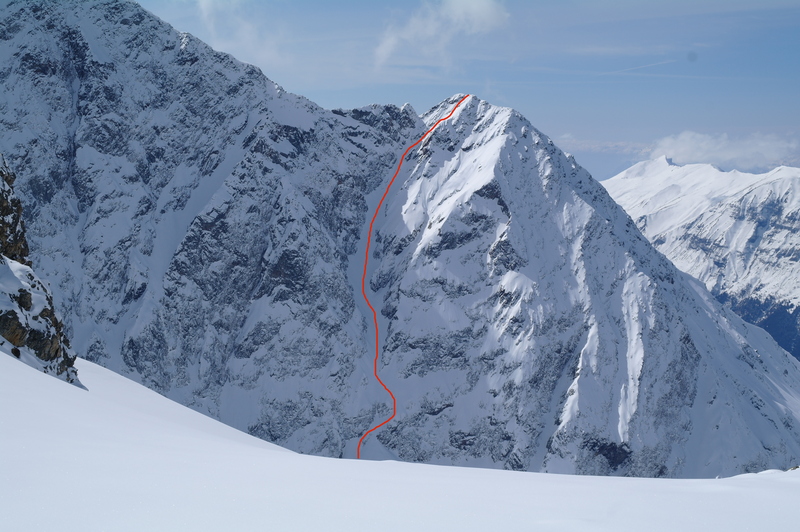 Having seen the Tricot couloir last year when approaching the Trappier couloir I did some research and found that my dear friend Dave Searle had skied it before so I stole his photo for the topo. Cheers Dave. Teaming up with my regular partner Tim, we were also joined by Tom Grant and Chippie. First lift up the Bellevue we headed up the tramway before skiing down to the Bionassay glacier and heading up towards the start of the couloir. We headed up the sometimes waist deep snow at a steady pace until have way up a lone skier popped out from a variant line and made us all question how he was ahead of us when there was no boot pack?! He had come up a different ridge and skied a different line that joins onto the NE couloir. After starting up the bootpack again we topped out just after 2pm. Enjoying great snow all the way down it felt very much like a free ride line and we all enjoyed the ski. Continuing down the glacier to the village and then skinning back up to Col Voza we were enjoying beers before the sunset. After making it to the Midi at 8am on a windy day we only made it as far as the mid station before they informed us the top was closed for the day and we had to think of another plan. Luckily Jesper and Mikko had a Plan B, the North Couloir of Mont Oreb. After ditching the glacier gear and 60m ropes we originally planned on using we got into the car and headed to Buet for the 1500m climb to the summit of Oreb. As we were nearing the top of Buet we turned off the skin track and headed along the traverse to the top of Oreb to find the entrance of the Couloir. Ross and Tom skied this line a month or so ago and had difficulties entering the corniced couloir. After we were convinced we found the right line Jesper went in on a rope to test the snow. After he was convinced it was a ‘go’, he quickly took off the rope and skirted away from the looming cornice just meters above his head. Making the first turns above the large cliff you then traverse in to the main couloir. Once we were in the couloir we were welcomed with cold fresh snow and a fun and fast 700m of descent. With some pockets of unstable snow we went one by one and played it safe in the flat light enjoying every turn. A quick ski down the river back to Le Buet and we had a round trip time of 6 hours. A fun day and a great line given the conditions! Following another dump of fresh snow, some sunny high pressure has rolled into Chamonix and with it some excellent conditions for ski touring. After chatting over a couple of ideas with Joel, we ultimately decided to head over to the Aiguille du Tour to check out its Table Couloir. The couloir is a classic of the Mont Blanc massif that neither Joel nor I had done before, so we were both psyched to check out something new and hopefully ski some good snow too. The tour starts in the Argentière basin with a climb up to the col du Passon. As always, the views in the basin were amazing. Conditions for both climbing and skiing are still looking a bit dry on the north side, but a lot better than they were a few weeks ago. Joel bootpacking up to the col du Passon. The start of January was not looking great until the mother of all storms rolled into the North West Alps and dumped a load of the cold white stuff on Chamonix and its surrounding mountains. Taking full advantage of this fresh snow meant traveling through to the tunnel to Italy where the Italians were working hard to open lifts, unlike here in Chamonix. Courmayeur delivered several deep days and then a few more followed here in Chamonix when the lifts finally opened. Then once the storm had passed the sun came back along with rise in temperatures, which seems now to be the trend. As people searched high and low to find the remaining good snow we found ourselves going to new places and having fun adventures. A new ski for me was the South Face of the Tour Ronde. A short access from Pointe Helbronner takes you there and we made the most of the snow line riding back to the car park, all be it in varying snow conditions. HERE is a short video. Meeting up with Mikko and another couple of Finns at Grand Montets we headed for the Chevalier with the hope of finding powder. I had come close to skiing this line 2 years ago, but just as I was about to drop in my boot broke and saw me skiing back to the top lift with one boot in walk mode. Thankfully this didn’t happen this time and we had it in great condition with powder turns all the way down this steep and varying line. HERE is another little video. A few years back I watched a Xavier de la Rue video of him snowboarding a ramp near the Swiss boarder. Back when I was a boarder I dreamt of taking on this hanging ramp. Noticing it in good condition a few days ago while touring near Col Forclaz I asked Mikko and Jesper if they wanted to join me to ski this short, but beautiful line. They were keen for an adventure so along with my usual partner Tim we headed along from the top of Le Tour to find the entrance. Greeted with great snow for the ramp and a nice spring decent back to Trient it was a great morning out. The North West Alps have received the snow it has been waiting for. Chamonix has seen heavy snowfall for the last week with day after day of powder turns. Having most of the valley shut due to high winds we have been heading through the tunnel to Italy and riding the trees of Courmayeur. Here is a little Video of last tuesday. Today the sun was out in Chamonix and Brevent had lots of fresh snow on offer. Its been over three months since my last post as I have been working away from Chamonix for the inter season. Arriving back at the start of December I had high hopes for a snow filled winter with heavy snowfall in the valley just days before my arrival. Two weeks back in the valley and we have been exploring all options for something worth skiing. 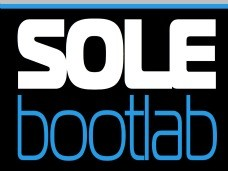 This winter I will be an ambassador for Voile Skis. Voilé make great back country skis and snowboards made in Salt Lake City, Utah. Light and solid they will fit right into my style of big mountain ski touring in the Mont Blanc Massif. Grand Montets has been fun cruising the pistes and there has also been some powder on the backside. But with rocks starting to emerge I have been forced to look elsewhere. Hotel face and a trip to Bel Oiseau near Emosson Dam have proved fruitful and it was fun exploring a new area. Today me and Ally Hurst headed up Flegere to climb the Aiguille Crochues Traverse. A great summer climb that can be done in trainers was a fun challenge in deep cold powder. Our initial plan was to ski the Col du Card back to the Flegere ski area. Just after reaching the summit we noticed a great looking couloir heading back to the Floria bowl. Chocked full of cold powder we decided to give it a go and hope that it didn’t cliff out. After a few hundred meters of great snow we only had the long descent back to the lift in heavy wet snow. Not that much fun on 160cm rando planks! When I put my skis away in June after skiing the Brenva Spur I was ready for a long summer of Alpine climbing. Looking back three months later it didn’t really feel like I accomplished a great deal. Although this is a list of classic D grade climbs I am left feeling slightly annoyed that I didn’t make the most of only working 20 hours a week. Last summer and especially over the winter I felt I made the most of my ‘Work Part-Time/ Play Full-Time’ lifestyle that I have somehow managed to attain. This summer has been different to the last few mainly because of the ridiculous heatwave that hit the Alps. Being from South Wales I’m not used to the sun and cannot function well when the temp is in the high 20’s. Although there is plenty of climbing to be done around Chamonix, I’m not one for ‘crushing’ sport routes down the valley or climbing splitter off the Midi. If I am climbing rock I like it to be an adventurous outing like the Grepon Mer-de-Glace. On routes like this you get the feeling you are out in the mountains away from the crowded routes that the Aiguille du Midi delivers (Climbed the Dent du Geant at 4pm thus no guided groups). The Grepon: Mer-de-Glace has to be the highlight of my summer. On the go for 17hours including the long walk back to Chamonix from the summit of the Grepon is what Alpinism is all about. Climbing the Epron Cosmiques and the Pyramide du Tacul has also shown me that despite them being short alpine crags I can still have fun in the mountains even when it is 30’c for the whole summer. Leading trad routes in the high 5’s has been my downfall over the last few years. Always opting to climb routes with high 5/low 6 sections with stronger climbers who I will normally nominate to lead the crux sections. However, heading to routes like these being the ‘stronger’ climber has taught me to push myself from time to time and be prepared to take a whipper (thankfully I didn’t) and prove I can develop my rock skills without having to climb more sport routes. Here are a few photos from the summer. Thanks for visiting and after a two month working holiday I will be back with more skiing related posts! Winter is coming. Earlier this week Joel, Ali and I headed up to attempt one of Chamonix’s classic alpine challenges, the Dent du Géant (or the “Giant’s Tooth” for those who don’t parle français). The Dent is an exceptionally aesthetic peek that soars out of the long ridge line defining the the French-Italian border and is one of Chamonix’s most recognisable and coveted peaks.